So I am involved in designing the heating system for a 3 story, 31 apts, a couple other random heating spots in the building, so maybe 40 zones or so. Not a big dealt but was curious what some of you do? They want zone valves for each apt, each apt will have about 16' of baseboard, and I imagine a 3/4" balance setter. The building is roughly 68 x 32, and my plan was to break my header up so each floor would have its own pump, so 4 zones total (basement, first, second, third, hot water) on the header. This would mean smaller pumps and a little simpler to control and troubleshoot. Thoughts? Also, I finally broke down and bought Siegenthalers design program, I am just waiting for it to get emailed to me, so I can figure up a bit more precisely what the sizing demands will be. Have you considered having point of use zone valves at each radiator? Or is there a set of specifications that you are required to follow that would not allow for that? Pipe it reverse return with variable flow primary and you can eliminate the expensive balancing valves and maintain a lower return water temp. You will probably have $4k into all those valves and another $4k to pay a T&B contractor. Put it into the better piping arrangement. Run 2 mod-cons in parallel to get the flow rate needed and a wider turndown ratio. Remember that due to stack effect, lower floors need just a little more radiation than upper floors. Remote zone valves are a pretty common and easy setup. Reverse return is great for balancing , sometimes the layout can be a challenge. If you use balancing valves, the Calleffi circuit setters are easy to set with no outside contractors needed. It would be simpler to use one Delta P circulator. You should be able to find a Taco Veridian or Grundfos Magnum that would match up well. The stack effect should be minimal if the building is constructed reasonably tight. I have found that the upper floor corner units underperform if the radiators are not upsized. A room by room heat loss will make this apparent. I like Siggys software. You won't be able to model flow on 40 zones and it won't have curves for many of the new ECM circs. You can use the flow and headloss numbers of the circs in the program to build a system curve and select circs that way. I appreciate the input guys. The design is up to me. The last one they did was zone valves on each zone, the zone valves will be in the common hallway above the drop ceiling. I liked the idea of smaller individual pumps per floor so its easier to troubleshoot and control and when its broken much simpler to get parts when its smaller pumps like a taco 3452, they stock them now. Im not saying its the best way, thats why im asking a multitude of counselors. I will probably do Caleffi balance setters for the ease of piping and knowing I have it right. This is the perfect place to use balance valves, properly set they will pay for themself in comfort and fuel savings. There are some modulating zone valves that can be used as on/ off and flow adjusters. If you know exact flow rates you can buy automatic flow setters, PIBV type. I agree with a delta P circ, or two if you need to split the job. I'd do 2-pipe steam, using something like Slant/Fin Multi-Pak 80 baseboard with the 1-1/4" steel element. TRV and trap in each apartment, Tekmar 279 to cycle the boiler, vent the heck out of the steam mains and dry returns, and you're done- don't ever have to drain the system to do repairs. If you want to get fancier, do a separate zone for the southern exposure with its own 279. I did a school with 80 classrooms. Each classroom had a vandal proof Danfoss thermostatic valves. It is piped reverse return with constant circulation. The modcon is piped primary secondary. It is the second year, and everyone is happy. Most apartment blocks here are reverse return with constant system pump or pumps. Here is a 100 unit apartment block 1.5 million in heat and a 500 feeding 3 119 gallon storage tanks. This one has no control in each apartment as most of our apartment blocks except the high en units. No complaints from anyone over this colder winter. The VWH just developed a leak between the heat exchanger and pan due to the gasket. It will be fixed this week. BTW, we vent through the roof and get combustion air sidewall when the chimney is too high. Does the building owner pay for heat or is there a method in place to bill each unit individually? 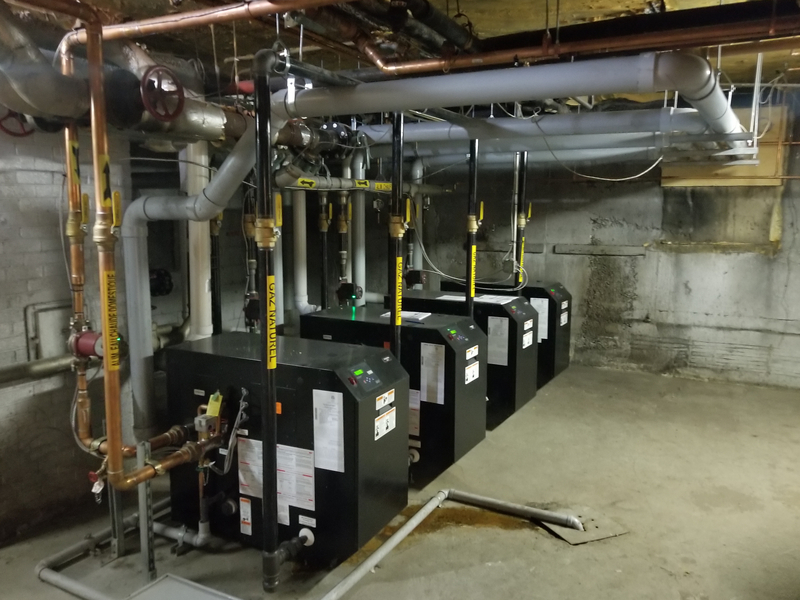 I own a single story 8 unit and when I built it, decided that each unit needs individual control and each is monitored by a basic hour meter coupled with flow rates and deltas from the radiant manifolds and flowmeters. It ends up within a few bucks every month once I got it dialed in. Primitive, and requires me to stop in once a month to read and record the meters but whatever, I'm happy with it and would do it again. That is setup with parallel return and a single Magna with Honeywell zone valves in the hallway outside each unit (so I don't need to fight for entry) and TA balancing valves. Yes, I still have tenants that keep their thermostat at 85 degrees while their windows are open, but at least they're paying for it instead of me or the neighbors. I did a dorm renovation a few years back. Used the point of use Danfoss thermostatic valves. Did not use the Vandal proof ones as you describe above. The owner Regretted that decision. Ended putting them in at a later date. They are a excellent valve and a great idea to use under these circumstances. Nice neat work. Good looking job.